Cajon Pass is a mountain pass in southern California dividing the San Gabriel and San Bernardino mountains. 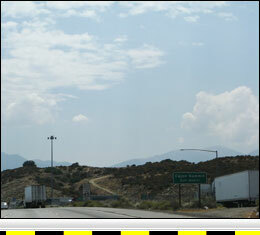 Cajon Summit is located on Interstate 15 approximately 11 miles south of Victorville, CA. Interstate 15 connects to both I-70 and I-40 and links the Los Angeles area ports to the Midwest and eastern US. Southbound I-15, from the Cajon Summit, has a steep vertical descent of about 1160 feet over the first 5 miles with a continued lesser descent for about 12 more miles. The reported grade for the southbound descent is 6% over 4 miles. A truck scale is located about five miles south of the summit. 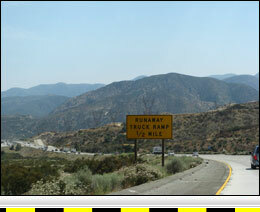 Interstate 15, between Cajon Summit and the truck scales, has a very steep 6% grade segment. Since trucks will likely have to stop at the truck scale on this grade, using a low gear it is extremely important to conserve their brakes. Northbound I-15 from Cajon Summit to Victorville has a vertical descent of only 1,144 feet over 11 miles. This descent is a very mild and steady, a 1 to 2% grade. Cajon Pass is well known for being the inspiration behind Clessie Cummins' "Jake Brake". In 1931, most heavy trucks were powered by gasoline engines. Cummins was promoting the diesel engine both as a better alternative and to raise publicity for the diesel engine. He and a crew of two other men attempted to set a new cross country truck speed record. 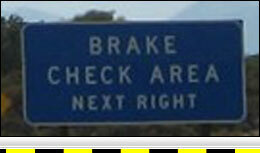 The route for this trip took them across Cajon Pass that at the time was traversed by U.S. Route 66. As legend has it, the truck reached Cajon Pass after sunset on the fifth day. Cummins knew there was a grade ahead but did not recognize the Spanish word Cajon on the sign marking the pass to be the "Kayhone" pass he was looking for. As a result the truck started down the grade in too high of a gear causing Cummins and crew to be subjected to a white knuckle ride to the base where they narrowly escaped a collision with a train's caboose at a rail crossing. After this trip, it is said that Cummins was determined to make his diesel powered trucks perform as good as gasoline powered trucks on downgrades. Years later, Cummins created the Jacobs Engine Brake that allows diesel engines to perform much better on downgrades. 9 2883 ft. -20 ft.